Pet care has become central to the lifestyle of any pet owner. Some people are even choosing to forego having children and raise pets instead. No matter what lifestyle you choose, there’s one thing that remains constant. Owners demand the best for their furbabies. And that means making sensible decisions about which toys to buy. 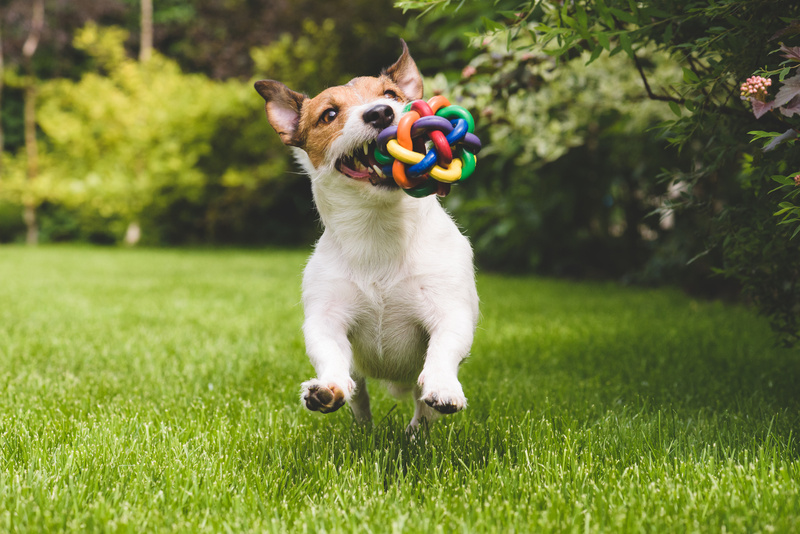 With many organic dog toys to promote optimal health, there’s never been a better time to be a dog or a dog owner. Here are our top 10 eco-friendly dog toys that are good for your dog and the world. This beautifully crafted plush bone bears a design reminiscent of the Rococo era of dog ownership. But it’s more than a decorative pillow for Fido to obliterate faster than you can say “My couch!” That’s because Harry Barker uses only the finest products in their craftsmanship. So unlike your one-of-a-kind antique throw pillows, these are made of completely dog-friendly, durable materials. While singing the praises of Harry Baker brand organic dog toys, you have to include their rope products. These products come in a number of shapes, colors, and sizes from traditional rope-shaped items to starfish, to the most adorable alligator you’ve ever seen. These, too, are made from cotton yarn with azo-free dye. Other benefits rope toys include your dog having cleaner teeth and a toy that isn’t likely to fall apart quickly. One of the more popular organic dog toys by Honest Pet Products is called the Eco-Tugger. This pull toy is non-toxic, chemical-free and lead-free. And it’s made from all natural hemp canvas. If there wasn’t enough to love about Honest Pet Products based on its organic toy selection, let’s add they are a woman-owned business. The company also employees developmentally-disabled adults who weave the hemp canvas with precision and care. Honest Pet Products does so much good for the people and pets in their local community, they’d make the Humane Society of the United States proud. West Paw Design makes a line of some of the most durable dog toys on the market. These are created with a plastic-like substance that was developed and registered by the company called Zogoflex(R). Zogoflex(R) is phthalate-free and BPA-free. It’s durable enough that the company can make the claim that the toy creates virtually no waste, and it’s recyclable too! This toy can withstand even the most intense puppy play time. That’s West Paw Design’s guarantee. If you’re dog’s maw if strong enough to destroy a Zogoflex(R) toy, they will replace it for you. If you tend to gravitate toward all things cute and plush but aren’t a fan of cleaning up the resulting puppy-nest of stuffing, Simply Fido has made the dog toy for you. Their line of 9″ stuffless toys are adorable, organic and they look so soft you could rub your face on them. But instead of being stuffed full of the dreaded synthetic stuffing of your nightmares, they have thin sheets of crinkle paper. That’s good for you and the environment. You’re free to live a less messy existence while your dog gets to roll around on top of something soft like the compulsive maniacs you both are. The High Roller, manufactured by Cycle Dog, is a bouncy ball with a twist. It’s durable because it’s made from post-consumer recycled rubber. This comes from things like bike tires and innertubes. Because of its unique shape, the ball is said to have erratic bounce patterns that make it a good fit for active dogs who require much exercise. Cycle Dog rubber toys also float, so dogs can play actively on land or in water. These are so durable they are even good for small spaces, like apartments, as they aren’t likely to tear and cause a mess all over your living space. But don’t forget, they bounce! Prepare to be dodging flying artichokes during your quiet evenings in. Planet Dog is on a mission to bring you the most durable dog toys on the market while providing sustainable toys made with great ingredients. Planet Dog Orbee balls are made with a proprietary compound called Orbee-Tuff. Orbee-Tuff is a thermoplastic elastomer (TPE), which is basically science-talk for a plastic that excludes nasty chemicals like BPAs and phthalates. If you have a dog that likes to chomp through all of the toys you offer in a bite or two, the Diamond Plate Ball will live up to its name. Offering a spin on traditional rope toys, Knit Knacks take cute to a whole new level. With a wide range of options to suit your furbaby’s adorable personality, Knit Knacks are always made with organic, chemical-free natural cotton yarn. These toys clean your dog’s teeth while they chew. So what’s it going to be? A football, a unicorn or a sweet smiling ice cream cone? The Kurgo Origami Crane is a beautiful toy inspired by the art of the Japanese but manufactured in the United States. The design has a squeaker to add an element of fun while the non-toxic nylon canvas massages your dog’s gums. If you want your dog’s toys to match your deep knowledge and appreciation of various cultures, then this is the right toy for your pup. No two children, I mean, dogs are the same. Your fur-family is as unique as you are. As such, it’s important to preserve your pet’s health and the environment so you can live long lives enjoying one another. One way to do that is by investing in eco-friendly toys. For more information on how you and your dog can go green for good, check us out here.